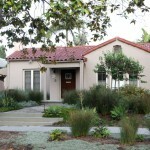 The Kay’s front yard landscape, once an expansive lawn, extends from the house to the curb. FormLA selected the hardscape and foliage materials to complement the home’s French Provincial architecture and thrive in La Canada’s hot, dry microclimate. Tufted Hair Grass forms an IdealMow meadow between the patio and primary path. 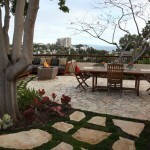 A unified flagstone patio surrounded by matching pavers with mossy joints exudes a sense of playfulness, while the clean lines of the overall design direct the eye to the breathtaking canyon and ocean views beyond. 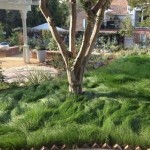 The new look for landscaping in Los Angeles reflects our creative culture. Conformity gives way to diversity and self-expression. Instead of chasing the look of other places, the latest look brings a vibrant authenticity and distinctive sense of place to L.A.
L.A. is home to some of the most extraordinary, diverse architecture in the nation. Why would we settle for conformity in our landscapes? We can use our outdoor spaces to transform our properties into creative works of self-expression. Synthetics further a boring aesthetic that is past its prime. Those concerned about sustainability would be better off sticking with the real thing! See tradeoffs beyond the aesthetic in Synthetics vs. IdealMow. While there will always be a place in L.A. for roses, camellias and other trophy foliage, the new look involves a cleaner aesthetic. 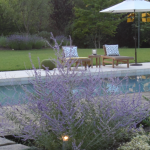 Trophy foliage becomes part of a broader play with new ingenues like hummingbird sage taking center stage. Why would we go from chasing the aesthetics of England to those of Arizona? 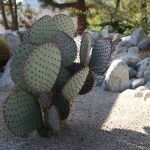 Cacti and succulents are climate compatible and suit some L.A. architectural styles, but a desert aesthetic is no more authentic to Los Angeles region than expanses of turf and roses. Foliage authentic to Los Angeles has a lush, vibrant, welcoming look. Permeable walks and drives help our limited rainfall replenish our aquifers and mitigate run-off. Aesthetically, they offer a casual elegance consistent with L.A.’s low key culture. As with the rest of the “Ins,” permeable walks and drives come in a variety of colors and textures, allowing for a high level of flexibility and self-expression. Homeowners must maintain the parkways in front of their homes – shouldn’t those spaces be part of our properties’ curb appeal? Can you imagine this extraordinary space with a parkway of turf? Out: Maintaining Your Garden – In: Enjoying Your Garden!